Biafran land is blessed by Chukwu Okike with enormous mineral resources and good soils. The whole world today has know Biafran people as very intelligent, innovative and talented people. 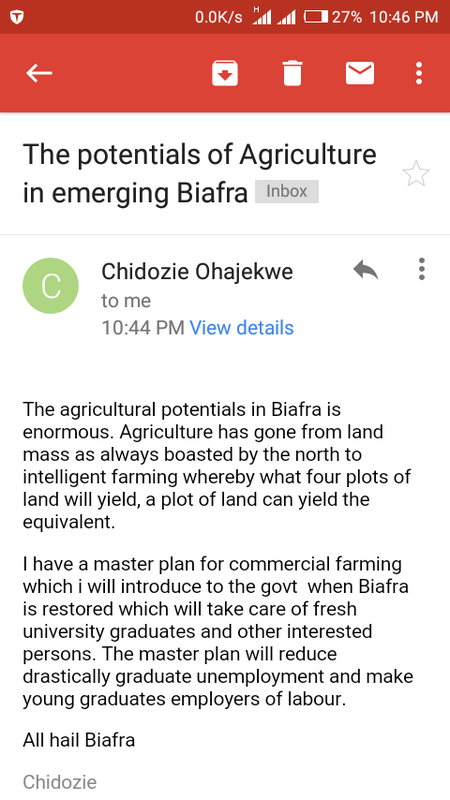 A pro Biafra activist by name Chidodie Ohajekwe has written to Agricultural Gist, in what he called "The potentials of Agriculture in Emerging Biafra" has stated that Agriculture has gone from land mass as always boasted by the north to intelligent farming whereby what four plots of land will yield, a plot of land can yield the equivalent. 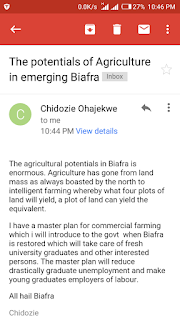 He further stated that when Biafra comes, he will bring out a master plan for Agriculture, which he will introduce to the government of Biafra, and is set to provide employment to the youths. Below is the snapshot of his statement.